Above: Jared on the climb to the summit of East Canyon. Photo: Dave iltis. Are your legs looking for a little punishment? Are you in the Salt Lake Valley and wondering where to go to give your lungs a workout? Road cyclists in the state’s capitol city are among the lucky when it comes to choices. If one wanted to, a cyclist in the valley could pick a different climb every day of the week and throw in numerous options to create almost-never-ending doses of vertical variety. Here, in clockwise order, are the climbs of Salt Lake County. City Creek Canyon: Distance 6 miles. Elevation gain: About 1,500 feet. Beginning at Memory Grove in downtown Salt Lake City, the climb up City Creek is a popular ride among urban workers and dwellers. Because the road is closed to cars on odd days and closed to bikes on even days from Memorial Day to the end of September (it is open everyday to cyclists the rest of the year), cyclists can find themselves with freedom to climb and descend with limited fear of what is around the next corner. After passing the water treatment plant half way up the canyon, cyclists find a narrow but scenic road that throws in some challenging stretches until you reach Rotary Glen Park. You can fill up water bottles at the top and catch your breath before a thrilling ride down the canyon. Make sure to watch for pedestrians, especially in the bottom section of the canyon and to keep your speed in check as there are several blind corners. Perhaps the most popular climb in the valley, Emigration Canyon begins at Hogle Zoo and offers a gentle climb for a few miles before a switch back tilts the road upward for the final ascent to the Little Mountain summit. With ample shoulders on both sides of the road, Emigration is typically crowded on most days and into the evening. For variety, keep riding over the top and throw in an extension of another 16 miles and 2,000 feet of climbing as you pass Mountain Dell Reservoir and head up to the Big Mountain Summit. If that’s not enough, visit the Pinecrest turnoff for a winding road past some mountain homes. There is also the Emigration Oaks subdivision half way up the canyon that throws in some steep pitches, dazzling descents and incredible views from atop the side of the canyon. A mountain biker’s dream, Millcreek also finds itself crowded with road cyclists as they take advantage of the limited traffic and stunning views to get some climbing in. Heading east from 3900 South, cyclists are able to climb past scout camps, summer homes and top-end restaurants until they reach the top of the canyon. Because of the entry-fee for cars, traffic is limited on most days and cyclists are able to relax a little bit as they climb and descend at speed. Be careful on the way down, however, as everyone – including bikes – are expected to stop at the fee gate near the bottom of the canyon. Looking for some pain? Look no further than Big Cottonwood Canyon. Salt Lake County’s longest climb, Big Cottonwood begins at 7200 South and doesn’t stop until you’ve reached Brighton Ski Resort. The first couple of miles are relatively tame, but once you hit Storm Mountain you’ll be hitting the granny gear and begging for mercy. A mile or two of tough climbing is rewarded with some less-strenuous work until you reach Solitude where the grade picks up another few degrees. Stopping at Brighton is reward in itself with amazing views and a chance to catch your breath. If you’re not done yet, however, roll back down the canyon a little bit and climb Guardsman Pass to really give yourself a workout. The descent is among the best in the state, but be careful when rounding corners. Bicycles often travel faster than cars going down the canyon and can create some sketchy situations if you’re not paying attention. There’s a reason the Tour of Utah sends the best professional cyclists in the country up this road. The steep grades and distance are an almost identical match to the Alpe D’ Huez – but without all the switchbacks. The Canyon takes you past Tanner Flat (a misnomer in many ways) and up to Snowbird before a finish at Alta. Tackle this one and you’ll have something to be proud of. Suncrest: Distance: 3.5 miles. Elevation gain: 1,300 feet. Not the longest and not the highest, the climb to Suncrest above Draper is nonetheless one of the most challenging pitches you can point your bike at. With grades in the 10-12 percent range, Traverse Ridge Road offers a short but intense workout that attracts many cyclists throughout the year. With a new and wide road, cyclists can leave the intersection with Highland Drive and enjoy safe riding to the top. Descending is an adventure with occasionally fierce crosswinds and high speeds. If you’re up for variety, start your ride lower in Draper at the shopping centers or take the Mike Weir Drive detour past South Mountain Golf Course and the Draper LDS Temple for even steeper bursts of climbing. Many cyclists in the Salt Lake Valley may not even be aware of Butterfield Canyon, but those who do know of the climb up the south side the Bingham Canyon Copper Mine can attest to its brutality. Because of its west-side location and limited winter access, Butterfield is a rarely-visited gem in the valley. After entering near the Wild Horse and Burro facility near Herriman, cyclists have an ‘easy’ climb for the first four miles with only 5-7 percent grades. After reaching a switchback at mile four, however, the climb gets as nasty as you’d hope for. Grades in excess of 15 percent for short stretches are interrupted with more of the 5-7 percent climb variety until more switchbacks jack the grade back into the teens. A stunning view at the top allows cyclists to look down into both the Salt Lake and Tooele valleys. If you’re feeling adventurous, try the dirt road extension at the top to the overlook into the Bingham Canyon Mine. 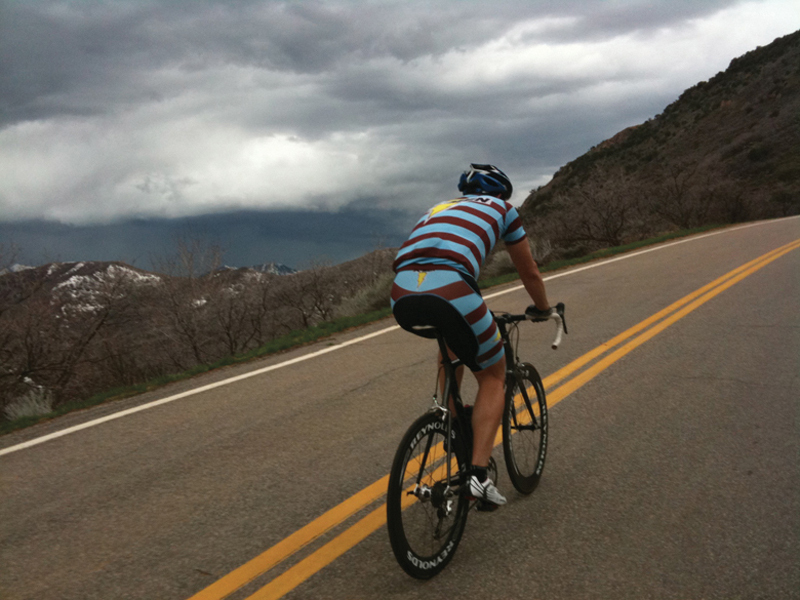 One Response to "The Climbs of Salt Lake County"